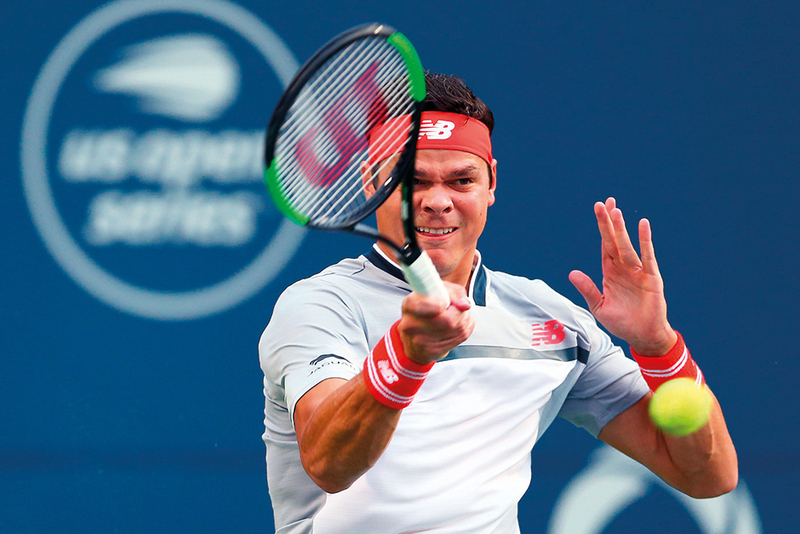 Toronto: Milos Raonic posted a second Canadian victory on Monday, joining Peter Polansky in the second round of the ATP Toronto Masters after a 6-3, 6-4 defeat of David Goffin. Vasek Pospisil missed out on a local hat-trick in a night match as the Canadian lost to Croatian Borna Coric 6-4, 6-3 after a three-hour afternoon rain interruption. Former Wimbledon finalist Raonic, ranked 29th due to an injury plagued 2017, won in his first match since going out in the Wimbledon quarter-finals to John Isner a month ago. World number 121 Polansky reached the second round for a third straight year, upsetting Australian world number 52 Matt Ebden 7-6 (7/3), 6-4. As in 2017, when he ran into Roger Federer after winning his home opener, Polansky could again face a Grand Slam champion, with Novak Djokovic lying in wait should the Serb overcome Chung Hyeon. Raonic sent over his 15th ace as well as a double-fault as he served for the win against 10th seed Goffin, who had no answer to the Canadian’s big game. The Belgian sent a return long to hand Raonic a match point, with the Canadian finishing it all off on his first chance as Goffin sent a forehand into the net after an hour and a quarter. The Canadian had to fight to secure the second set, having saved three break points as he served for the opener. “I’m glad to have gone through that. I’m also glad he didn’t make any returns. This was a good win, but there is another match coming which will create a lot of problems for me. In other matches after the bad weather passed, 11th seed Diego Schwartzman crushed Kyle Edmund, the lone Brit in the field after the withdrawal of Andy Murray, 6-1, 6-2. Jack Sock, who has not won a match since before Roland Garros more than two months ago, lost in the first round for a fourth straight event, going down 6-3, 3-6, 6-3 to Daniil Medvedev. Benoit Paire reined in his fearsome temper to earn a straightforward first-round win after a costly outburst on court last week. The volatile 55th-ranked Frenchman advanced over American Jared Donaldson 6-3, 6-4 to set up a showdown with top seed Rafael Nadal. Paire exploded in anger last week during a first-round Washington loss to Marcos Baghdatis, destroying three racquets and earning a massive fine of $16,500 (Dh60,555;14,300 euros). Nadal leads the draw with holder Alexander Zverev, the weekend champion in Washington, the second seed. Federer is skipping the event during the week of his 37th birthday and will return next week in Cincinnati at his only scheduled tune-up event prior to the US Open. Belarusian qualifier Ilya Ivashka extended his run of weekend success as he beat Japan’s Yuichi Sugita 6-2, 6-3. Pablo Carreno Busta advanced when Japan’s Yoshihito Nishioka retired after the first set. Meanwhile, Venus Williams avoided an upset at the hands of fellow American Caroline Dolehide, holding off the 19-year-old 7-5, 6-1 to claim her first round match at the Rogers Cup on Monday. “I think she had a really great second serve,” Williams told reporters, of Dolehide. “I think I got a better feel for it in the second set. In the first set, I was still figuring it out.” Dolehide displayed her full potential in March when she nearly took down world number one Simona Halep at Indian Wells. Against Williams, the young player lost momentum late as Williams claimed 12 of the final 14 games of the match. Pliskova beat Katerina Siniakova 6-4 6-4 while Goerges overcame Timea Babos 3-6 7-6(3) 6-4. Among those yet to play are top-ranked Halep and number two Caroline Wozniacki of Denmark. The top eight seeds all received first-round byes.